Young Adam Wingnut Smith was part of the original Cronulla Skid Kids and earned a rep for charging Shark Island at the tender age of 14. 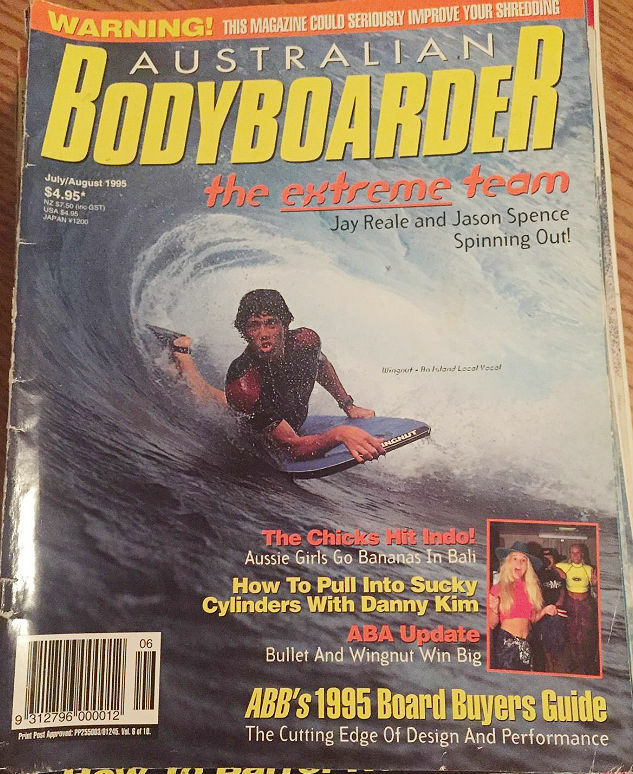 Wingnut was recently inducted into the Riptide Bodyboarding Hall of Fame photo Stroh early 90s. Wingnut in his prime carving a clean line out of the bowl at Surge. Adam had shot up considerably in size since his micro-grom days and was now packing some muscle into each turn. A damn fine tube rider as well. Photo by CSP Circa late 90′s. Adam Smith began bodyboarding at a very young age , by the time he was 10 years old he already had a name in the sport. Wingy was the first bodyboarder to be sponsored by Manta and by the time he was 12 he was already a regular in the Shark Island lineup where in the coming years he would earn his place at the top of the pack as one of the best of the all time Island crew. Below Wingut shows where he got his nickname photo Stroh ’89. Adam Smith alias Wingnut busted onto the bodyboard scene as a 10 yearold hell grommet and quickly made a name for himself with his charging and full on ripping approach. This Manta adv from the early 90′s shot at Mystics by Stroh.